Apart from my daily crack at obtaining the Horseman’s Mount, along with the occasional BG & heroic, most of my game time has been spent working tirelessly on my UI. My goal has mainly been to make it more focus-friendly, but I’ve also added a few new bells and whistles, as well as tightened up a few loose ends. So far I’m really pleased with how it’s shaping up, and I’ve yet to notice any major issues or bugs. …will you be adding to your stable in Cataclysm? With the proposed change to stable slots, hunters will now be able to keep a stable of 25 pets. We’ll have 20 slots available via the stable master, plus another 5 (it looks like) in our on-demand stable. I’m so stoked over this change, I can’t tell you. It’s not that I need 25 pets, I just want to be able to have more than 5. You may remember some months back I posted about helping a guildie obtain Loque’nahak for their hunter alt. What took me umpteen hours to accomplish, I helped them do in about 15 minutes. This very same hunter had also been talking about wanting to tame Skoll for the past couple of months. Anyway… one evening after our raid was done, I flew into the Storm Peaks to collect my sack of snowballs from the big blue chick in Brunnhildar. Being the pet obsessed hunter that I am, I can’t help but travel past Skoll’s spawn points anytime I’m in the Storm Peaks. I’m not even looking to tame him, it’s just that seeing a Spirit Beast out in the wild excites me. Yeah, I’m kinda weird… I know. Well, as fate would have it, just as I’m passing over the frozen lake towards the Snowdrift Plains… who do I see… Bam! Even though taming Skoll is probably one of the last things I needed to do, I couldn’t resist. However, this will most likely be the last I see of him for awhile. After patch 3.2.2 ruined my joy of PvP as a Beast Master, I’d been kinda lost. I hadn’t really been available for raiding, so PvP was about all I wanted to do when I was logged on. My knee-jerk reaction to the Beast Mastery nerf was to abandon BM in favor of MM or SV for PvP, but… since I was already specced MM for raids, that would mean being sans Beast Mastery spec for the first time, like… ever… This made me sad in the pants. So… I decided maybe I’d give BM a go for raiding, and wait to decide on my PvP spec. Reason being was, I just couldn’t imagine not being able to pull King Krush out of the stable once in a while to stretch his legs. He’s my favorite pet and he’s exotic, plus his coolness factor just rose considerably now that he’s become virtually impossible to solo-tame. Also, I’ve still yet to see another Hunter with him in-game… ever. Since I had my two recently-made-available stable slots, I putted around Azeroth last week looking for some new companions. 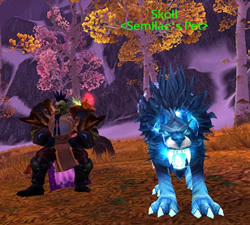 I put Skoll on my rounds just because I was bored and I still hadn’t seen him out in the wild. So, while tooling around the Storm Peaks a few nights ago, NPCScan starts going all wonky and then who do I see… you guessed it. I had a pet with me, but since he was at his Bor’s Breath location, it was just a quick trip over to Frosthold to stable my pet. I flew back and tamed him up. Why, I don’t know, but I just had to do it. I’m hopeless I guess. I have to say… he is pretty nice to look at in game. The aura around him looks great.